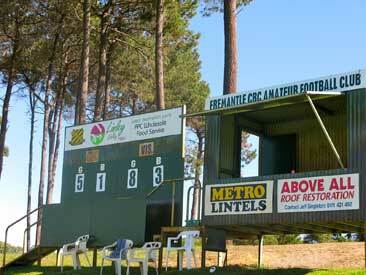 The Morris Buzacott Reserve in the leafy south-of-the-river Perth suburb of Kardinya is the home of the strong Western Australia Amateur Football League club Fremantle CBC. There’s been a subtle change in the club in recent times. When I watched a lower grade game I noticed the players called their team ‘Freo’, rather than, say, ‘The Christies’ or ‘The Blue Boys’. Fremantle CBC won A-grade premierships in 1967 and 2000. There’s a distinguished list of past players including Gerard Neesham who won the A-grade fairest and best award for the WAAFL in 1974 before embarking belated on a career in the WAFL and AFL.